Agile methods are quickly growing in popularity, and recent statistics on agile adoption show that more and more organizations have already tried agile methods on their projects. As this wave of agile use spreads, those adopting these methods are less connected to the top experts in the field: early adopters learned the techniques from the experts who invented these methods, but now people are learning from those whose knowledge and expertise may be questionable. As a result, lots of conflicting information has been released in recent years, and many teams have said that they are "doing agile" when, in fact, they were just using the agile label as an excuse for not following sound practices. In this recording of a live teleseminar, learn some of the most common misconceptions about agile methods and hear the real story about the agile techniques. 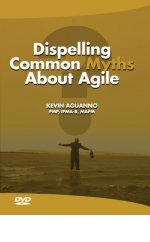 Join host Kevin Aguanno as he dispels the myths about agile and gives you a better understanding of these methods. How do misunderstandings about agile methods arise?